Pictures of homicide victims hang on display during the Homicide Survivors' Candlelight Vigil Saturday evening. 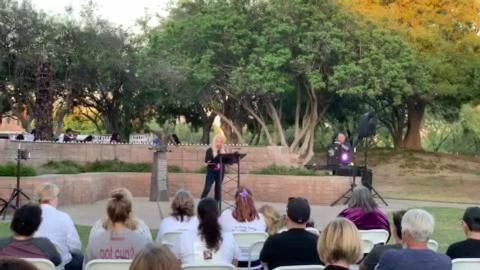 About 150 people gathered together at the Children's Memorial Park not only to honor those they loved, but to show other families they are not alone as they continue life after tragedy. Abrian Gonzales, whose daughter Maribel was killed in 2014, said it was his fourth time coming out to the Homicide Survivors’ event in honor of her. “When someone is taken at the hands of violence in our community, a family is shattered, they endure an unimaginable tragedy and a community feels less safe," Napier said. April Barbosa was one of two people asked to speak about her family member who was killed. At the podium she remembered her daughter Rosaura, who was killed in 2018.